Scroll down to view all available lofts for sale or for lease. Kirby Lofts was built in the 1920's and converted into Lofts in 2005. 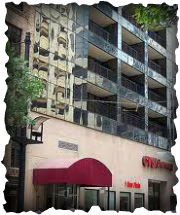 It is an 11 story high rise and offers front door access to the Light Rail and direct access to the Tunnel and shopping. Kirby Lofts units have Granite countertops, stainless appliances, and sold oak hardwood floors. Many of the lofts have balconies overlooking the new Main St. water fountains. Amenities include: Controlled Access to building | Fitness Center | Elevator | Off-Site Parking.